Mansfield Town’s scheduled home match against Grimsby Town this Saturday has been postponed due to international call-ups to three of Stags’ players. On loan defender Ryan Sweeney has been called up to the Republic of Ireland U21s, who will face Israel on Thursday and Germany next Tuesday in the UEFA European U21 Championship. Captain Krystian Pearce is set to represent Barbados in a CONCACAF Nations League Qualifier against El Salvador this Saturday. St. Kitts & Nevis have selected forward Omari Sterling-James in their squad for their CONCACAF Nations League Qualifier at Saint Marteen on Sunday. Sterling-James has also been called up for St. Kitts & Nevis when they play Canada on 18th November. The club state a new date for the match at home to Grimsby will be announced in due course. All tickets purchased for the original fixture will remain valid for the new date. 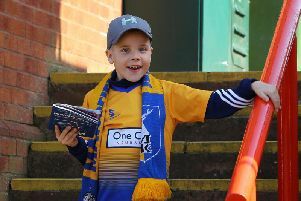 It is the second game which has been called off for Mansfield this season because of international call-ups following the postponement of Mansfield’s match at Crewe on Saturday 8th September. A new date for this fixture has yet to be arranged.